^ 1.0 1.1 Population and living conditions in Urban Audit cities, larger urban zone (LUZ). [2013-09-17]. ^ Edinburgh, United Kingdom Forecast : Weather Underground（weather and elevation at Queensferry Road, Edinburgh）. The Weather Underground, Inc. [2013-09-29]. ^ 3.0 3.1 3.2 Mid-2013 Population Estimates Scotland. gro-scotland.gov.uk. [2014-07-07]. （原始内容存档于2014年7月14日）. 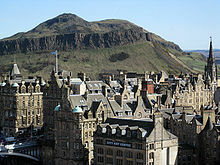 ^ Edinburgh-World Heritage Site. VisitScotland. [2013-02-10]. （原始内容存档于2013-02-22）. ^ City of Literature. cityofliterature.com. [2013-02-27]. （原始内容存档于2013年2月1日）. ^ The University of Edinburgh. [2013-09-30]. ^ Edinburgh second in TripAdvisor UK tourism poll. BBC News Online. 2011-05-03 [2013-03-16]. ^ Williams, Ifor. The Beginnings of Welsh Poetry: Studies. University of Wales Press. 1972: 47. ISBN 0-7083-0035-9. ^ Chadwick, Nora K. The British Heroic Age: the Welsh and the Men of the North. University of Wales Press. 1968: 107. ISBN 0-7083-0465-6. ^ Dumville, David. The eastern terminus of the Antonine Wall: 12th or 13th century evidence. Proceedings of the Society of Antiquaries of Scotland. 1994, 124: 293–98. ^ Cessford, Craig. Gardens of the 'Gododdin'. Garden History. 1994, 22 (1): 114–15. ^ Earliest evidence found of settlers in Scotland: hazelnuts and stone tools excavated near Edinburgh date to around 8500 BC. [2013-10-31]. （原始内容存档于2013年11月2日）. ^ Coghill, Hamish. Lost Edinburgh. Birlinn Ltd. 2008: 1–2. ISBN 1-84158-747-8. ^ Ritchie, J. N. G. and A. Edinburgh and South-East Scotland. Heinemann. 1972: 51. ISBN 0-435-32971-5. ^ Fraser, James. From Caledonia to Pictland: Scotland to 795. Edinburgh University Press. 2009: 171 [2013-02-13]. ISBN 0-7486-1232-7. ^ Watson, William. The Celtic Place Names of Scotland. 1926: 340. ISBN 1-906566-35-6. ^ Lynch, Michael. The Oxford Companion to Scottish History. Oxford University Press. 2001: 658. ISBN 978-0-19-923482-0. ^ Daiches, David. Edinburgh. Hamish Hamilton. 1978: 15. ISBN 0-241-89878-1. ^ Dickinson, W C. Scotland, From The Earliest Times To 1603. Edinburgh: Thomas Nelson. 1961: 119. ^ Dickinson, W C. Scotland, From The Earliest Times To 1603. Edinburgh: Thomas Nelson. 1961: 236–8. ^ Donaldson, Gordon. The Scottish Reformation. Cambridge University Press. 1960: 53. ISBN 0-521-08675-2. ^ Donaldson, Gordon. Scottish Kings. Batsford. 1967: 213. ^ Newman, P R. Companion to the English Civil Wars. Oxford: Facts on File Ltd. 1990: 13. ISBN 0-8160-2237-2. ^ Stephen C. Manganiello. The Concise Encyclopedia of the Revolutions and Wars of England, Scotland, and Ireland, 1639–1660. Scarecrow Press. 2004: 587 [2013-02-11]. ISBN 978-0-8108-5100-9. ^ Chambers, Robert. Notices of the most remarkable fires in Edinburgh, from 1385 to 1824. : 11 [2013-02-17]. ^ Wilson, Neil. Edinburgh Encounter. : 37. ISBN 1-74179-306-8. ^ Scott, Paul. 1707: the Union of Scotland and England. Chambers. 1979: 51–54. ISBN 0-550-20265-X. ^ Defoe, Daniel. A Tour Through The Whole Island of Britain. London: Penguin. 1978: 577"... I believe, this may be said with truth, that in no city in the world so many people live in so little room as at Edinburgh." ^ Topham, E. Letters from Edinburgh 1774–1775. Edinburgh: James Thin. 1971: 27 [2013-03-18]. ISBN 1-236-68255-6"... I make no manner of doubt but that the High Street in Edinburgh is inhabited by a greater number of persons than any street in Europe." ^ Graham, H. G. The Social Life of Scotland in the Eighteenth Century. London: Adam and Charles Black. 1906: 85 [2013-03-18]. ^ Lenman, Bruce. The Jacobite Cause. Richard Drew Publishing. 1986: 104 [2013-03-18]. ISBN 0-86267-159-0. ^ Keay, K; Keay, J. Collins Encyclopaedia of Scotland. HarperCollins. 1994: 285. ISBN 0-00-255082-2. ^ History of Princes Street. princes-street.com. [2013-02-14]. ^ William Robertson. William Robertson and the expansion of empire. Cambridge University Press. 1997: 2 [2011-02-18]. ^ Blackwood's Edinburgh magazine 11. 1822: 323 [2011-01-18]. ^ Letter from Matthew Bramble on August 8. The Expedition of Humphry Clinker. Project Gutenberg. 2000 [2013-10-13]. ^ Youngson, A J. The Making of Classical Edinburgh. Edinburgh University Press. 1988: 256. ISBN 0-85224-576-9. ^ Hogg, A. Topic 3:Problem Areas. Scotland: The Rise of Cities 1694–1905. London: Evans Brothers Ltd. 1973. ISBN 978-0237286569. ^ McWilliam, C. Scottish Townscape. London: Collins. 1975: 196. ISBN 0-00-216743-3. ^ McWilliam, C. Scottish Townscape. London: Collins. 1975: 197. ISBN 0-00-216743-3. ^ Coghill, H. Lost Edinburgh. Edinburgh: Birlinn Ltd. 2008: 219–220. ISBN 978-1-84158-747-9. ^ Keay, John. Collins Encyclopaedia of Scotland. 1994. 1994: 286. ISBN 0-00-255082-2. ^ 49.0 49.1 Rae, William. Edinburgh, Scotland's Capital City. Mainstream. 1994: 164. ISBN 1-85158-605-9. ^ Scotland Act 1998. 1998-11-19 [2013-03-15]. ^ Geographia Atlas of the World (Map). London: Geographia Ltd: 99. 1984. ISBN 0-09-202840-3. ^ Seven Hills of Edinburgh. VisitScotland. [2013-02-28]. ^ Voltaire said: Athens of the North. Scotland.org. September 2003 [2013-03-28]. ^ 54.0 54.1 54.2 54.3 54.4 Edwards, Brian; Jenkins, Paul. Edinburgh: The Making of a Capital City. Edinburgh University Press. 2005: 64–65. ISBN 0-7486-1868-6. ^ Stuart Piggott. Scotland before History. Edinburgh University Press. 1982. ISBN 0-85224-470-3. ^ 57.0 57.1 Overview of the Water of Leith. Gazetteer for Scotland, Institute of Geography, University of Edinburgh. [2009-04-19]. ^ The Water of Leith Walkway. Water of Leith Conservation Trust. [2009-04-19]. ^ 59.0 59.1 59.2 Review of Green Belt policy in Scotland – Edinburgh and Midlothian. Scottish Government. 2004-08-11 [2009-04-10]. ^ 60.0 60.1 60.2 60.3 60.4 60.5 60.6 Regional Climate – Eastern Scotland. Met Office. [2009-04-19]. ^ December 2010 minimum. [2011-10-31]. ^ Mean Royal Botanic Gardens Edinburgh Climatic Averages 1981–2010. Met Office. [2012-12-22]. ^ 63.0 63.1 Edinburgh Comparisons – Population and Age Structure (PDF). City of Edinburgh Council. [2009-01-31]. （原始内容 (PDF)存档于2009年2月5日）. ^ Comparative Population Profile – Edinburgh Locality. Scotland's Census Results Online (SCROL). [2009-01-31]. ^ Lynch, Michael. The Oxford Companion to Scottish History. OUP Oxford. 2001: 219. ISBN 0-19-969305-6. ^ 66.0 66.1 66.2 Edwards, Brian; Jenkins, Paul. Edinburgh: The Making of a Capital City. 2005: 9. ISBN 0-7486-1868-6. ^ Gilbert (ed. ), W M. Edinburgh in the Nineteenth Century. Edinburgh: J & R Allan Ltd. 1901: 95, 120, 140. ^ 68.0 68.1 Edwards, Brian; Jenkins, Paul. Edinburgh: The Making of a Capital City. 2005: 46. ISBN 0-7486-1868-6. ^ Edinburgh Comparisons – Dwellings (PDF). City of Edinburgh Council. [2009-02-08]. （原始内容 (PDF)存档于2009年3月18日）. ^ The UK Competitive Index 2010. Centre for International Competitiveness. [2010-05-10]. ^ 71.0 71.1 Edinburgh by Numbers. [2014-06-16]. （原始内容 (PDF)存档于2014-06-11）. ^ Tesco creates 200 banking jobs in Edinburgh. The Scotsman (Edinburgh). 2009-03-02 [2013-02-09]. ^ Virgin Money provides jobs boost for city. The Scotsman (Edinburgh). 2010-01-13 [2010-05-10]. ^ Edinburgh Airport Masterplan July 2011 (PDF). edinburghairport.com. [2013-02-12]. （原始内容 (PDF)存档于2013年2月15日）. ^ Our company. Lothian Buses. [2012-02-09]. ^ LOTHIAN BUSES plc CONSOLIDATED REPORTS AND ACCOUNTS (PDF). Lothian Buses. [2012-02-09]. （原始内容 (PDF)存档于2013-01-26）. ^ Pigott, Nick (编). Waterloo still London's busiest station. The Railway Magazine (Horncastle, Lincs: Mortons Media Group). June 2012, 158 (1334): 6. ^ Edinburgh CrossRail project. Scottish Government. 2001-12-04 [2013-02-19]. ^ Edinburgh rejects congestion plan. BBC News. 2005-02-22 [2013-02-08]. ^ Wiseman, Richard Joseph Stewart. Edinburgh's Trams: The Last years. Stenlake Publishing. 2005: 2–3. ISBN 1-84033-343-X. ^ Scrapping Edinburgh trams would cost £750m. BBC News. 2011-06-23 [2013-03-30]. ^ £45m boost for new tram network. BBC News. 2006-01-26 [2013-02-19]. ^ 83.0 83.1 83.2 Lynch, Michael. The Oxford Companion to Scottish History. Oxford University Press. 2001: Pg. 610–615. ISBN 0-19-211696-7. ^ UNIVERSITY OF EDINBURGH RANKINGS. Quacquarelli Symonds. [2013-02-12]. （原始内容存档于2013年2月14日）. ^ History of Heriot-Watt University. Heriot-Watt University. [2013-02-12]. ^ Lytton, Charlotte. Edinburgh Napier University guide. The Daily Telegraph (London). 2011-06-20. ^ Primary Schools. City of Edinburgh Council. July 2006 [2008-05-26]. （原始内容存档于2008年1月12日）. ^ Scottish Council of Independent Schools. SCIS Pupil Statistics 2009 (PDF). 2009 [2012-02-12]. （原始内容 (PDF)存档于2012年9月16日）. ^ Iomairt Ghàidhlig Dhùn Èideann. duneideann.org. [2014-05-02]. （原始内容存档于2014年5月17日）. ^ The Edinburgh Festival & Fringe Festival. timeout.com. [2013-02-10]. ^ Edinburgh International Film Festival. Edinburgh International Film Festival. [2014-04-07]. ^ Scottish Science Festivals. The Scottish Government. [2011-01-12]. ^ 94.0 94.1 Hogmanay-the Scottish New Year. BBC. 2006-05-10 [2011-01-13]. ^ Theatres in Edinburgh and the Lothians. VisitScotland. [2013-02-09]. （原始内容存档于2013年1月26日）. ^ Heritage & Culture. The Scotsman. UK. 2010-02-27 [2011-01-13]. ^ Bristol is UK's 'most musical city'. The Daily Telegraph (London). 2010-03-12. ^ John McLeod: Composer. Johnmcleod.uk.com. [2009-07-08]. ^ Kirsty Scott. 10 of the best museums and galleries in Edinburgh. The Guardian (London). 2011-10-12 [2013-02-10]. ^ Portrait of the Nation. National Galleries of Scotland. [2011-01-13]. ^ Simon Schama's Power of Art. [2011-01-13]. ^ Trio grande. Heraldscotland. [2011-01-13].